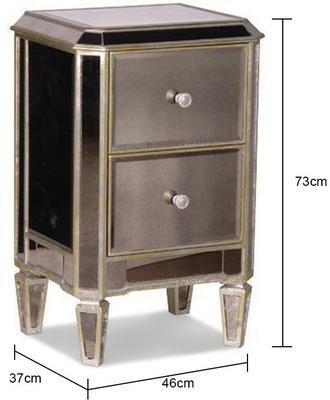 With this Two Drawer Antique Venetian Bedside, you can decorate your room in a luxurious, artistic style. Handmade using MDF for the base and antiqued glass for the rest of the body, this bedside is multifunctional and stylish. It is made with a smooth top surface which can hold a lamp or a stack of books. 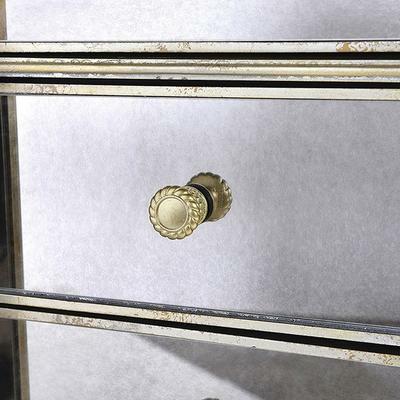 Two drawers are situated at the front, each one bearing a coordinating handle. 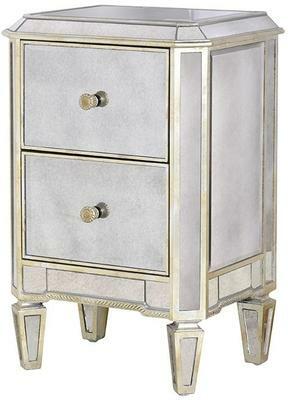 The body of the bedside is lined with champagne gold coloured trim. This complements the antique white perfectly. Meanwhile, pointy legs complete the look. Use this inside your bedroom or even as a living room side table. You can find a host of similarly designed furniture in the shop as well.